Last Friday I posted my goals for the fall months - particularly, that I'm doing a pantry challenge for the month of October. This means that I will only be eating from what we currently have on hand in our fridge, freezer, and pantry. And no, I absolutely will not be stocking up this weekend. (Not that I have time, as I'll be marathoning the Harry Potter movies with my friend, Natalie.) I'm not going to be ordering in or grocery shopping, no eating out lunch or anything like that. Just going as long as I can without spending money on food. Wondering what I'm going to eat for the next month? Me too! Juice. Pure cranberry and pure lemon. I love sour. There's also a container iced coffee left. But that's it. The fridge is mostly John's domain, and I'm not tracking anything of his in there that I won't eat. Things that could be in the fridge soon: pasta sauce, salsa, and pesto. When my dad cooks, he cooks for an army, despite the fact that it's just him and my mom, and sometimes me. So their freezer is stockpiled with those 3 things, and I won't hesitate to grab some if I need them. Free food. Frozen Veggie Burgers. 6 of these on hand at the moment, but if I end up eating two on Sunday, I'll update. 120 Ounces of Canned Black Beans. I don't know where they all came from, they just multiplied. Dried Black Beans. Looks to be about a cup or two, who knows if I'll even get to it. Dried Green Lentils. 16 ounces of these, they're from Brandless too. Canned Vegetables. One of green beans, one of corn. 26 Mini Packs of Pretzels. John's mom went to Costco. 1 Container of Italian Style Breadcrumbs. 2 Boxes of Mrs. Grass Soup. 11 Bags of 'Boil in a Bag' Brown Rice. Each bag makes 2 cups of rice. 1/2 a Box of Graham Crackers. 1 Bag of Tortilla Chips. 1/2 a Costco Container of Cashews. Pink Himalayan Salt and NuSalt. This might seem like a strange addition, but it's important to know that I have a lot of this because I like fasting. 24 hour and even longer fasts are often recommended to heal a lot of issues in the body. Normally I get these benefits by intermittent fasting, which just means restricting the window during which I eat to say just lunch and dinner time, or even just dinner. But if I really want to fast for a full day or two, then I have to get electrolytes, which I get by 1 teaspoon of each of those salts (NuSalt is a salt substitute, it's the potassium chloride you'd need) in a liter of water and fasting is much easier. Spices and Condiments. I have a whole rack of the usual spices, none of which are very low. I also have a good amount of condiments, like mustard, soy sauce, vinegars, and olive oil. Baking Supplies. We have sugar, white and brown, flour, cornstarch, baking soda, and vegetable oil. I'm not a big totally from scratch person, but if I use these up, it would be fine - November, with Thanksgiving and the coming of more holidays that you bake cookies for, is when all of these things are on sale. Stock up for the year rock bottom prices type of on sale. So at least if I go through all my spices and baking supplies, I know that restocking these in November is ideal anyway. Coffee and Tea. Lots. No dangers of running out. Thank goodness because I would absolutely break the challenge to buy coffee. I'm a very testy person without coffee. And that's the list! Now to see how far that gets me, but I think it's going to go a very long ways. Yes, loads of quinoa with beans and vegetables but that's my go to meal anyway. And spices really change a dish. 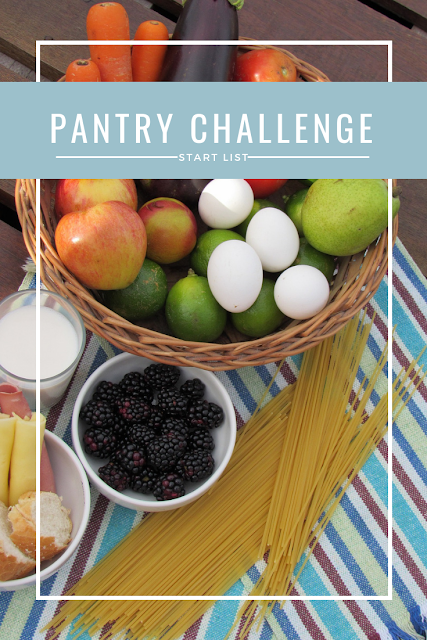 Are you doing a pantry challenge in October, or a no spend month?